The Peak District is a National Park in central England (Figure 1), characterized by a unique geology and geomorphology which are the product of processes extending back to the Late Tertiary period, approximately 25 million years ago. 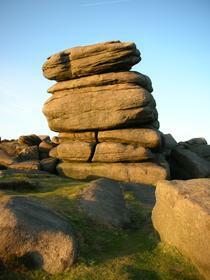 The National Park takes its name from its two distinct regions called the White and Dark Peaks. The White Peak consists of limestone outcrops which have a distinctive gray coloring, whereas the Dark Peak, which surrounds the White, is more elevated and composed of darker gritstones, sandstones and shales. The foundations of the area were laid down 340-350 million years ago in the Carboniferous (Mississippian) Period when what is now central England was at the Equator and covered in a tropical sea. During this period, the calcareous (calcium rich) bodies of microscopic sea creatures and coral accumulated on the sea bed, forming thick layers of what became the limestone of the White Peak and the bedrock of the entire region. Periodically, volcanic eruptions extruded lava onto the sea bed, meaning that igneous rock is also found in the region today, locally named Toadstone. The tropical sea slowly became shallower, as it was filled with silt deposits from numerous rivers flowing into it. These deposits, on top of the older limestone, lithified to form solid rock, initially resulting what is known today as shale and later, with coarser deposits, a form of sandstone known locally as gritstone. Ultimately, this sea became completely infilled and tropical rainforests developed on the fertile land. It is these, that in time, developed into the region's generous coal measures. The region remained relatively undisturbed, although moving poleward through continental drift, until around 60 million years ago when tectonic movements resulted in the region being uplifted, in various phases, into a dome-shaped anticline. Over time, the uplifted peak of gritstone was eroded away by forces of denudation, exposing the underlying shales and limestone (the White Peak), with gritstone outcrops remaining at the periphery (the Dark Peak). This sequence of processes and climate change has led to the creation of unique and characteristic landforms in the National Park. 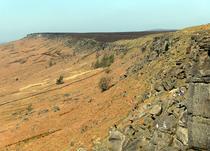 At the periphery, the remaining exposures of gritstone form what are locally termed "Edges", such as Birchen Edge and Stanage Edge (Figure 2) which are manifested as cliffs around the White Peak which are popular with climbers today. Over time these edges will continue their retreat through weathering and erosion. In other parts of the area, the interbedding of shale and gritstone has led to instabilities and resulted in the formation of numerous landslide features including that at Mam Tor which has been active for many years and extends nearly 1 km in length (Figure 3). Tors are an additional landform characteristic of the region (although confusingly, Mam Tor is not a tor, this is simply its name). Tors consist of protrusions of bedrock through the surrounding regolith that may rise many metres above the surrounding land (Figure 4). Theories as to their origin abound, but they most likely formed in the region when it was within the tropics and subject to deep weathering processes, widening joints in the bedrock, and have since become exposed as the weathered material above has been eroded away. An alternative theory is that they were produced in periglacial environments with freeze-thaw activity shattering the exposed bedrock material and erosive processes removing the material. In the central White Peak region, the limestone rock and persistently wet conditions have led to the formation of characteristic karst features including sink holes, gorges and caves, formed as water percolates through and enlarges existing rock joints by solution weathering. 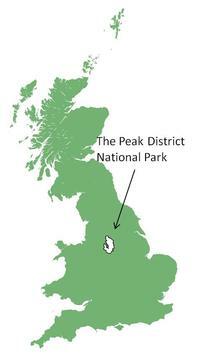 The Peak District National Park is deservedly one of the most visited English national parks for climbing, hiking, camping and caving. It owes this versatility and its dramatic scenery to millions of years of geological processes which have shaped and sculpted it. Arkwright, J.C., Rutter, E.H. & Holloway, R.F. (2003). 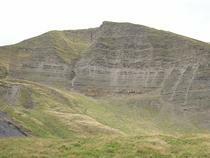 The Mam Tor landslip: still moving after all these years. Geology Today, v.19, pp.59-64. Dalton, R., Fox, H. and Jones, P (1999). Classic Landforms of the Dark Peak. The Geographical Association, University of Derby. Wolverson Cope, F. (1997). Geology Explained in the Peak District. Scarthin Books, Derbyshire.